COLD, CLOUDY DAY: Temperatures are basically unchanged across Alabama since early this morning. We have upper 30s and low 40s at mid-afternoon, with clouds hanging tough as expected. 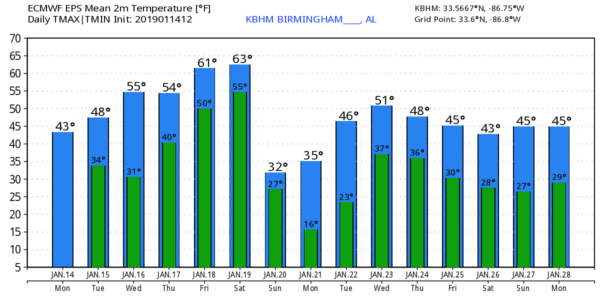 Birmingham reported 41 degrees at 2 p.m.; that is 13 degrees below average for Jan. 14. We will forecast gradual clearing tonight and Tuesday morning, and Tuesday should be a brighter day with a partly sunny sky and a high around 50 degrees. Wednesday will be dry as well; with a good supply of sunshine we project a high in the mid to upper 50s as the warming trend continues. THURSDAY/FRIDAY: Clouds move back into the state Thursday, and a few periods of rain are likely Thursday afternoon and Thursday night. Rain amounts should be around one-half inch, and the high will be in the 55- to 60-degree range. Friday looks dry and pleasant with a partly sunny sky; the high Friday afternoon will be in the low to mid 60s. SATURDAY: Clouds move in quickly Saturday morning, and more rain is likely Saturday afternoon and Saturday night with a dynamic weather system approaching from the west. The main window for rain comes from about noon until midnight, and rain amounts of one-half inch to three-quarters of an inch are likely. Some thunder is possible with temperatures expected in the 60s Saturday afternoon, but no severe storms are forecast because of the lack of instability. COLDEST AIR SO FAR THIS SEASON ARRIVES SUNDAY: Sunday will be windy and much colder; communities across the northern half of Alabama will most likely remain below freezing all day, and a north wind of 15-30 mph will push wind chill values down into the single digits. Snow flurries are possible after midnight Saturday night into Sunday morning as the Arctic air rushes into the state, but for now we are not expecting any significant impact or accumulation. The cold air is the big story. The wind will die down Sunday night, and the sky will clear. By Monday morning, we project lows in the 10- to 19-degree range over the northern half of Alabama, with 20s all the way to the Gulf Coast. Then, Monday will be sunny with a high in the low 40s. REST OF NEXT WEEK: Dry weather with moderating temperatures is the story for Tuesday and Wednesday; rain should return Thursday as a surface low forms in the Gulf of Mexico. ON THIS DATE IN 1982: Alabama was in the midst of a catastrophic ice storm/winter weather event, which continued over multiple days. Twenty Alabamians died as a result of the winter storm, and another 300 were injured, with damage totaling $78 million. About 750,000 people lost power, some for weeks.